THE Union Ministry of Environment and Forests, or MoEF, has given final clearance to the POSCO steel project in Odisha. While doing so, it ignored the forest rights claims of people living in the project site in Jagatsinghpur district. The gram sabhas of two of the seven affected villages—Dhinkia and Gobindpur—had written to the ministry on March 10 about their resolution not to part with their land for the project unless the process of recognising their rights over the forestland is completed. They relied on the Forest Rights Act (FRA) of 2006, which recognises the rights of forest dwellers over forests and its resources, and says such people cannot be evicted unless the process of recognition of rights is completed. The ministry’s own order of July 2009 makes it mandatory for state governments to furnish affidavits from the gram sabhas of affected villages giving consent to the project and certifying that the FRA process has been completed. But MoEF chose to go along with the claim of the state government that there are no forest dwellers eligible for forest rights at the project site and that the resolutions passed by the two gram sabhas are “invalid and fraudulent”. On May 2, MoEF gave the Odisha government permission to divert 1,253 hectares (ha) of forestland for the project proposed by the South Korean steel giant, Pohang Iron and Steel Company (POSCO). Union Minister of State for Environment and Forests Jairam Ramesh justified his decision saying the “implementation of both FRA and the July 2009 order is a learning and evolving process since we are still in largely uncharted territory”. He said the decision will not “weaken” the implementation of FRA. The steel plant was initially given forest clearance in 2009 on the condition that rights under FRA would be settled. Odisha government circumvented the condition by claiming there were no forest dwellers at the project site who are eligible for forest titles under FRA. 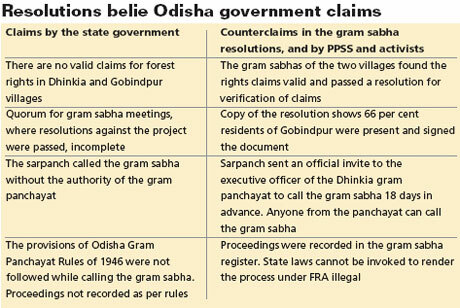 The state government’s claim was proven a lie when a sub-committee of the National Forest Rights Act Committee, set up by MoEF and the Union tribal affairs ministry, submitted documentary evidence showing the presence of traditional forest dwellers at site. Later, another committee of MoEF, constituted to inquire into the issues related to POSCO, confirmed these findings. Last November, the Forest Advisory Committee of MoEF recommended temporary withdrawal of forest clearance to the project. But this did not stall the project. On January 31, MoEF said the state could proceed with the project if it gives an undertaking that there are no legally tenable claims of forest dwellers in the project site (see ‘POSCO gets green signal’, Down To Earth, February 28, 2011). But uncertainty over clearance to the project continued when Dhinkia and Gobindpur sent their gram sabha resolutions. These were brought to the notice of MoEF by the POSCO Pratoridh Sangram Samiti (PPSS), a people’s forum spearheading the anti-POSCO movement. When the two resolutions were referred to the Odisha government, it said the resolutions were passed without the necessary quorum and therefore invalid. Under FRA, the gram sabha meeting for passing a resolution should be attended by at least two-thirds of a village’s adult population. In Dhinkia only 69 of the total 3,445 adult voters signed the resolution; in Gobindpur only 64 of the 1,904 voters signed it, the state government said. It also said the gram sabhas have to be convened by the gram panchayats and resolutions should have been recorded in the format prescribed by the Odisha Gram Panchayat Rules of 1964; these procedures were not followed. Rather, the sarpanch (panchayat chief) of Dhinkia called the meeting without being authorised by the gram panchayat, the state government said, adding it would take action against the sarpanch for transgressing his jurisdiction. 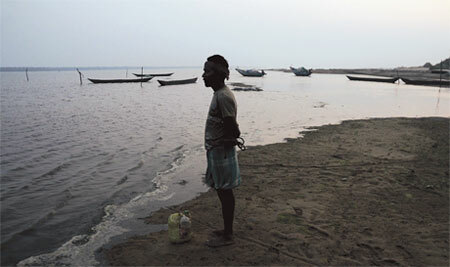 MoEF accepted the state government’s claims. But copies of the resolutions contradict what the Odisha government says (see ‘Resolutions belie Odisha government claims’). They show 1,638 people signed the resolution of Dhinkia and 1,265 people signed the resolution of Gobindpur. “The state government is lying. If not all, most of the villagers were present in the meeting,” says Prashant Paikrey, spokesperson for PPSS. “We had e-mailed just the first page of the list of signatures to the ministry; the rest of the pages were sent via registered post. MoEF is either going by the emailed signatures or is trusting the lies of the Odisha government,” he adds. The activists have also picked holes in the other claims of the state government. They claim FRA does say that gram sabha has to be called by the gram panchayat but does not specify who should call the gram sabha on behalf of the gram panchayat. “When the sarpanch of Dhinkia panchayat himself has certified the resolutions are genuine, what is the point in saying gram sabhas were not convened legally,” asks Sanjay Basu Mullick of the National Forum for Forest People and Forest Workers (NFFPFW), a group of organisations working for forest rights. Mamata Dash of NFFPFW says the gram sabha meetings were convened legally under FRA and, therefore, Odisha Gram Panchayat Rules of 1964 do not apply. “FRA is a Central Act, which overrides state laws. You cannot invoke a state law to say the process under FRA is illegal,” she says. PPSS shot off a letter to the environment minister on May 2, explaining the matter after it got hold of the state government’s reply dated April 29. The minister made only a passing reference to this letter in his order. Without going into the counterclaims, Ramesh reasoned that “faith and trust in what the state government says is an essential pillar of cooperative federalism”. The environment minister, however, seemed unsure about the state government’s claims. He called for immediate action by the state government against the Dhinkia sarpanch so that its claim of him acting “fraudulently” is confirmed. “If no action is taken forthwith, I believe the state government’s arguments will be called into serious question,” says Ramesh. Activists criticise Ramesh’s reasoning and say local elected governments must be respected. “In the federal structure of India, local governments are in no way inferior to state legislature. Ensuring this is the whole purpose of the Panchayati Raj Act and the Forest Rights Act,” says Leo Saldanha of nonprofit Environment Support Group. “The Centre cannot rate the state’s position over that of a panchayat,” he adds. Questions have also been raised about the validity of MoEF’S clearance because at present there is no memorandum of understanding (MoU) between the Odisha government and POSCO; the MoU signed in 2005 expired last year. “Every government activity in favour of the project is invalid when there is no MoU. If any land acquisition starts in the project area, it will be illegal,” says Ashok Agarwal, a Supreme Court lawyer and member of POSCO Pratirodh Solidarity, a group of organisations and individuals. The fact that Ramesh did not even wait for the MoU to be renewed shows the haste with which the government is pushing for POSCO, he adds. PPSS is now planning a mass agitation. “No policeman, government official or company employee will be allowed to enter the villages,” declares PPSS spokesperson, Paikrey.